Rate this Article If you're not sure which classes to play as in Era of Arcania, this is the article you'll need to read! Era of Arcania is a stunning, 3D mobile MMORPG that is pretty popular among the casual MMO gamers, mainly because it has incredible graphics that can run on mid to lower-end devices, a storyline where you are cast into the role of a hero, and an idle-like, auto-combat-fueled gameplay which allows players to have fun without actually needing to spend their own time grinding away to earn levels. So, if you happen to be a newcomer to the game and are out looking for some tips, this Era of Arcania guide should be able to help you. We’ll go through every one of the 5 classes available in the game, explaining each class’ strengths and weaknesses in addition to any relevant details. Hopefully, this guide will be able to help you decide on a class that’s best suited for you, but if not, know that you can always go back to the character creation screen and simply create another class to play (up to 3 per account). The brave and mighty warriors are the second-easiest class to play in Era of Arcania on the account that they simply hack and slash their way through most enemies and are typically built to take a lot of punishment from either mobs/monsters or bosses alike. Wielding a sword and shield, they also have unique protective skills, allowing them to mitigate damage that they are usually unable to avoid. 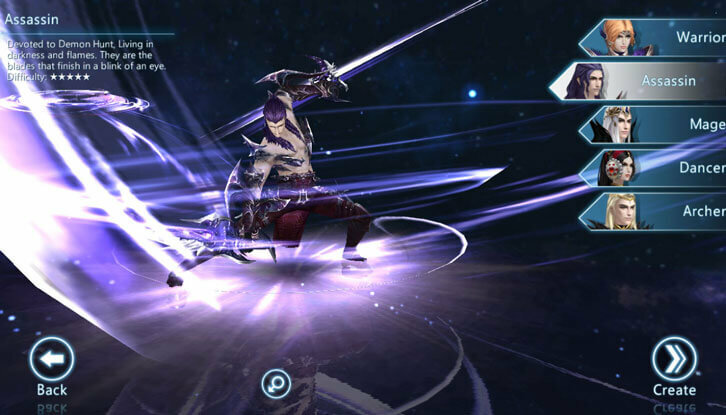 Their strength lies in the fact that they can withstand a lot of damage due to passive damage mitigation via armor and skills, while dishing out substantial damage of their own. This is a class that does well to protect himself without sacrificing to much DPS. Warriors, however, do have a slight weakness – they are melee characters and hence, they are more vulnerable to certain skills like knockbacks and stuns (most stun skills require you to be close by to work) and also to ranged attacks and kiting. The assassin class in Era of Arcania are bona fide demon hunters, at least in the context of the game’s storyline, and they thread the thin line between light and darkness. Offering a more fast-paced action, they use claw-like weapons to gouge at their enemies and have skills that allow them to make quick work of their opponents in a close-up and personal manner. This class has the highest difficulty rating among all the other classes, however, and this is mainly because as lethal as assassins usually are, in this game, they are a tad bit weak when it comes to dealing damage… which is supposed to be their one and only role. 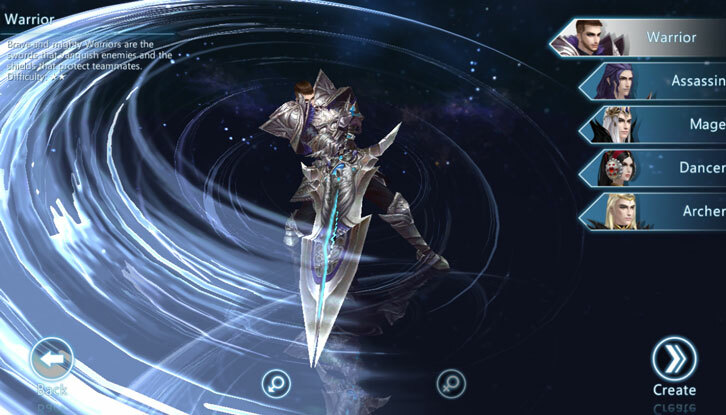 On the other hand, they do have stuns that work well to their advantage in light of their weaker damage skills. All in all, this is not an easy class to play, but if you do it right, it can turn out to be quite rewarding for you. 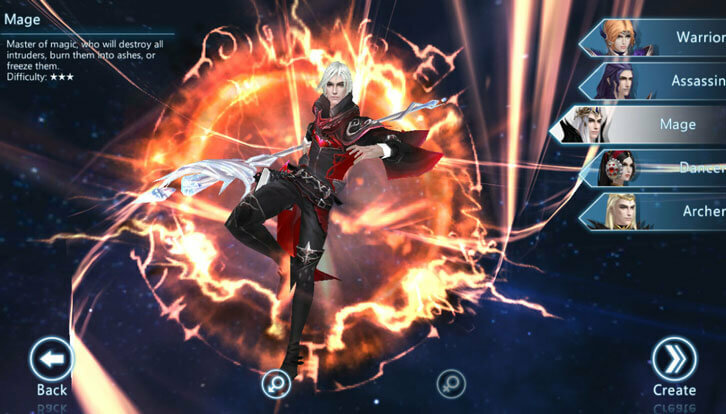 Personally, I have always liked playing the Mage class in any MMORPGs. They are the masters of magic, wielding the elements like they are mere toys, and frankly, most of the mage’s skill animations are usually pretty awesome to behold. In this game, it is no different. Their advantage lies on the fact that they can deal some serious damage from afar. A mage’s skills may have a bit more cooldown to offset the massive damage they produce, but if you have great timing and know when to activate a skill (or a spell), you can easily and quickly knock out your opponents. 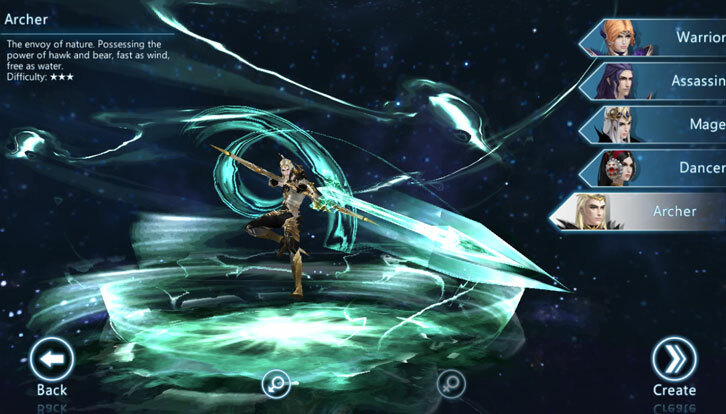 Mages also have great area-of-effect skills, allowing them to take on multiple foes. However, as you may know, mages are cloth-wearers. Even with some defensive spells, they don’t exactly have a lot of armor to begin with. Their health pool is usually low as well since most stats will be going towards increasing their mana pool (so they can cast more spells) instead. So, in other words, they can die pretty quickly and hence, should avoid taking any damage for as much as they can. That being said, Mages aren’t too difficult to play or too easy since they have an average difficulty rating - same as the Archer class, in fact. So, if you have a good head on your shoulders and know enough to avoid dangerous areas marked on the ground or tap dodge as needed, then this class might just be the class for you. The most unique class in the game, the Dancer, is more of a support/DPS class since she can heal herself and others to a small degree. However, in exchange for the heals and to some extent, her longer survivability, she has lower damage, which seems fair. The only qualm I have about this class though is the armor, or more specifically the cloth-like armor that mages usually wore. Healing in this game is a really nice advantage but it is by no means overpowered and can say… restore your entire health bar from the brink of death to full in seconds. Having poor armor deals a huge blow to this class’ overall survivability, in addition to the lower damage, making this class not as easy a class to play as the difficulty rating states. 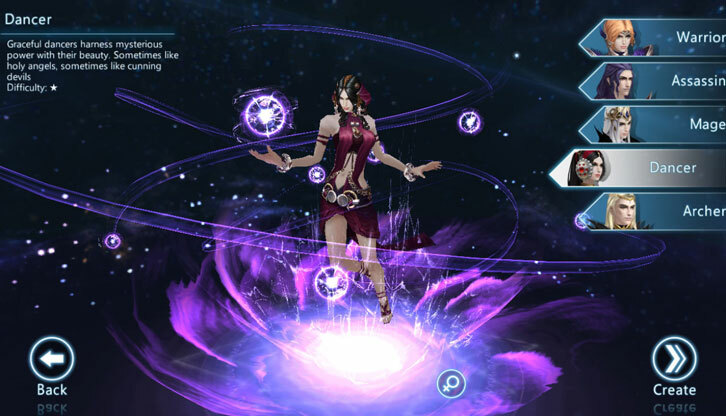 Nevertheless, players might want to try this class just because it’s unique – and it truly is – and because of the pretty cool, orb-like animations of her skills. The Dancer is also the only class in Era of Arcania that cannot be played as a male. Last but not least, the nimble and agile Archers! This is another one of my all-time favorite classes – you may have noticed my tendency to pick classes that deal ranged damage – mainly because they are often as quick in their damage dealing as a typical Assassin class, but they have the added advantage of being able to deal all of their damage from a distance. They have great survivability as well due to their armor and their aversion to close-quarter combat. The unfortunate thing about this class though is that they, like most ranged classes, are vulnerable to melee classes if they manage to get close enough. They are also more vulnerable to certain boss skills that affected ranged classes specifically. But when it comes to cool animations, this class has some really nice ones. Also, it’s technically not very difficult to play – it’s about average.